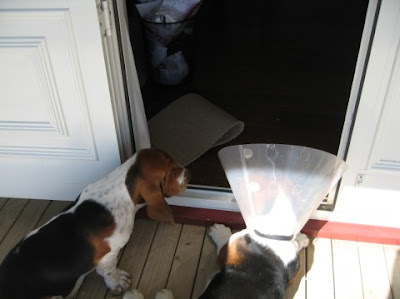 It’s not been a good time for the bassets this week. 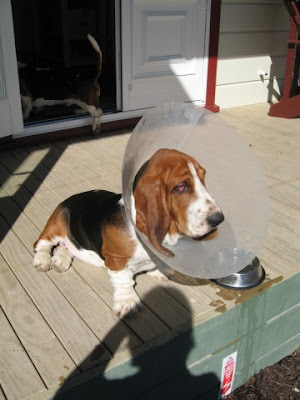 There was a set back this weekend in Fortnum’s recovery following his insistence on licking his stitches. As a result he was packed off to the vets to get a buster collar fitted and antibiotics/painkillers. It was an alarming experience for both of us when he first put on the collar. He simply stood in a catatonic state staring at me with complete bewilderment. He did however start to realise that standing in one spot forever wasn’t going to be helpful and by the evening he was starting to womble around a bit getting his big hat caught on the ground. 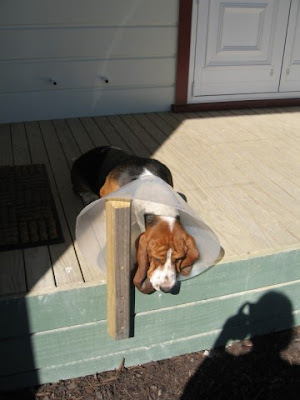 It was a pretty sleepless night on Sunday as he got it stuck and started barking and then pleading with me in the wee hours of the morning to take the thing off. The hard hearted person I am refused but did allow all 22kg of him to climb into my lap for him to go back to sleep. By Monday he was getting used to his new attachment and has increased his capability to play, run, drink and eat whilst wearing his collar. However, the moment we take it off for some relief he promptly heads for a good lick of this stitches. But he is starting to recover now and hopefully by the weekend we’ll be able to relieve him of his collar. Mason has been frustrated and upset by it all too. After all he lost his playmate and the rough and tumble that he loves to have has been curtailed. Also he’s been losing out on the attention stakes making him dream up as many new ways of being mischievious to get attention as possible. I can’t imagine what it must be like to wear a big plastic cone around your head but I’m proud of Fortnum for being such a placid dog and tolerating it as well as he has. There is no doubt he’d rather be without it but the recovery is now back on track and before he knows it he’ll be back to normal. Today the puppies were treated to some time with their two legged domestic executive being allowed to sit on the veranda outside DE HQ. It wasn’t long before Mason was exploring over the door threshold and having real fun with me chasing him out again. Oh, not to mention pulling all the paper out of the waste basket too! 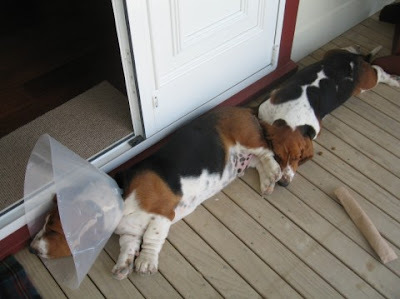 Here’s some basset blogging to demonstrate. Fortnum with his hat stuck! Banished to the veranda for a snooze!